Conquest and Civilization in the Mythical Homeland of the Aztecs. Who will have the richer kingdom before the time of the Exile comes? In the mythical land of AZTLÁN™, four tribes strive to survive and prosper under the scrutiny of the gods themselves. Only one of the four tribes will be granted the right to stay in this blessed land when the Time of Exile comes, at the end of the Fifth Age of the Sun. Guide your tribe to build the mightiest empire through the Five Ages, win the favor of the gods, and become the greatest ruler in the land of Aztlàn. 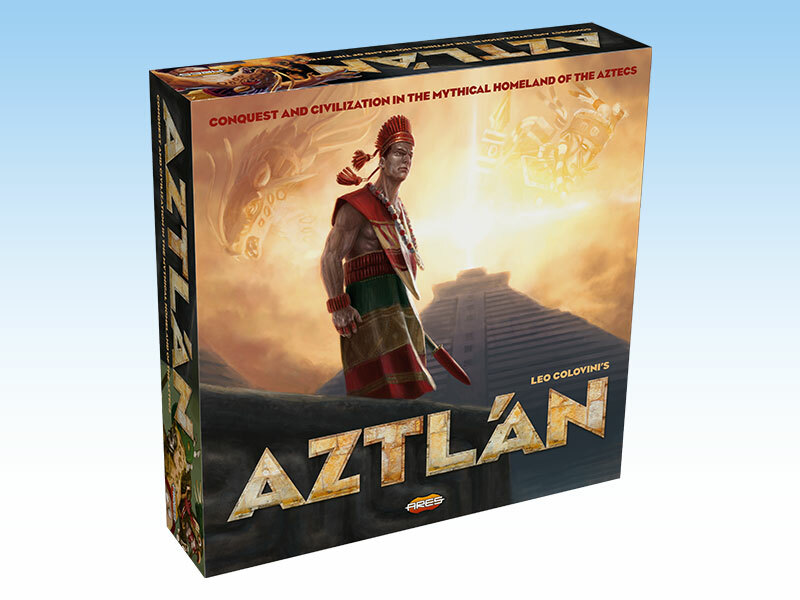 Aztlán is a game with easy to learn rules, deep and engaging strategic game play, and high quality components..
Aztlán can be played by 3 or 4 players (or 2 players with the "Aztec Gods" variant). In a multi-player game, each player guides one of the four tribes. A game is divided into five stages, called ages. At the beginning of each age, each player secretly chooses one of his power cards, and then, one at a time, places a certain number of his tribe pawns in one of the territories on the game board. The game board is divided into five different types of territory: deserts, terraced fields, jungles, mountains/volcanoes, and cities. The power card chosen for the age indicates the strength of that player’s tribe and identifies one type of territory (of the five different types). The greater the domains of that player, and the greater the number of territories of that type included within them, the higher the victory point score. If a territory is disputed by several players, the strongest tribe may defeat the weaker ones; but war is not the only path to victory and peaceful coexistence with the other tribes sometimes brings greater rewards. At the end of the fifth age, the player who scores the most victory points is the winner. His tribe rules Aztlán, while the time of Exile befalls his opponents!